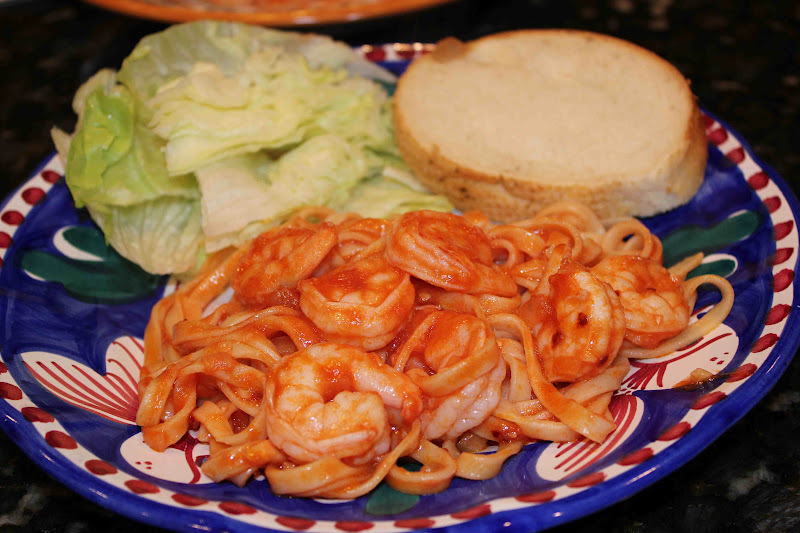 This was the first dinner I ever made my husband (when we were dating) and he absolutely loved it! Actually the first words out of his mouth were, “This is a lot better than I thought it would be!” For those of you who don’t know, my husband is not big on seafood, so he didn’t want to tell me that when I was about to cook our first dinner. What is crazy is that he loves sushi, and he likes cold shrimp cocktail. He will only eat salmon from Houston’s (a restaurant in Dallas), and he only likes crab legs from some exclusive restaurant in Atanta. My husband says he hates seafood, but it sounds to me like he kind of likes it! 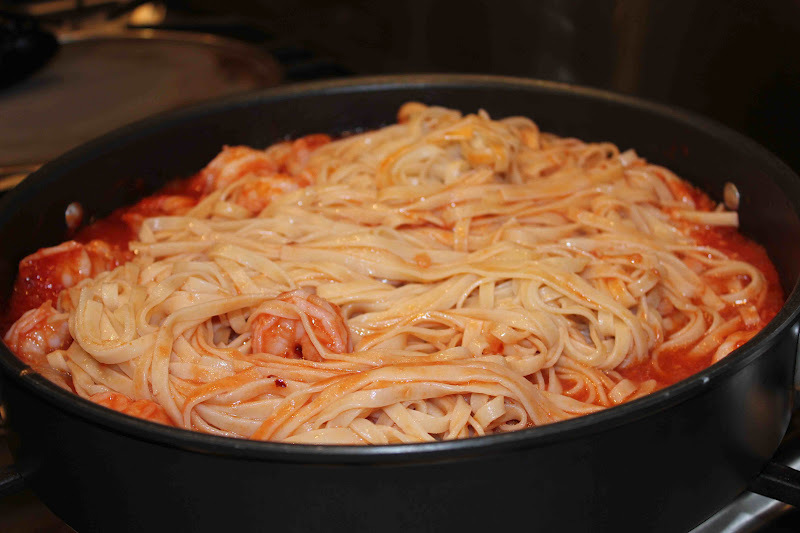 For this recipe, I sometimes use the curly, corkscrew pasta from Williams-Sonoma instead of linguine because it holds the sauce really well and it is fun to eat. I love this dish; its spicy, simple, and fast to make. Plus I would consider it quite healthy! Cook the onions in olive oil for 3-4 minutes. 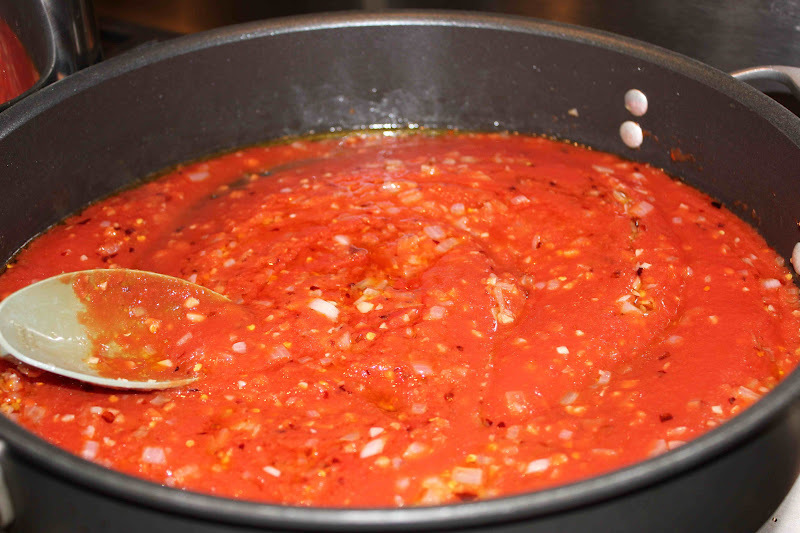 Add the crushed red pepper flakes, tomato sauce, and tomato paste. Now add the shrimp and cook for 2 minutes. Finally add the drained pasta and reserved pasta water. Stir all ingredients together and cook another 3-4 minutes. Garnish with Parmesan cheese (unfortunately we were out…) and serve immediately. 1. Cook pasta in salted water for 5 minutes and drain. SAVE 1 cup of cooking water! 2. 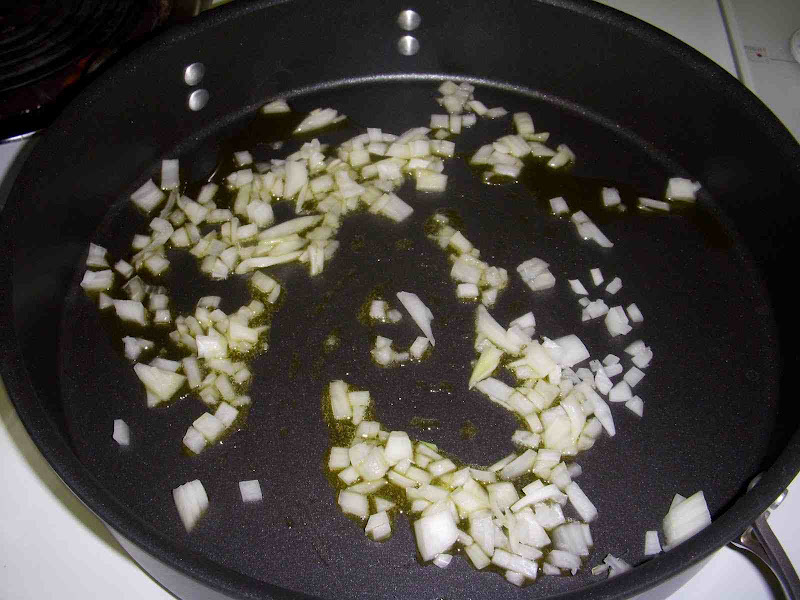 On medium high heat, cook 1 cup diced onion with 6 tablespoons olive oil for 3-4 minutes. 3. Add 3 tablespoons minced garlic and cook for 30 seconds. 4. Add 2-3 tsp crushed red pepper flakes. 5. Add 1 1/2 cups tomato sauce and 2 tbsp tomato paste and cook for 5 minutes. 6. Add 1 1/2 pounds of shrimp and cook for 2 minutes. 7. Add drained pasta and 1 cup of cooking water and cook for 3-4 minutes. One Response to "Emeril Lagasse’s Shrimp and Linguine Fra Diavolo"
I have actually loved reading through your articles. You certainly know what you are referring to! Your site is so simple for you to find their way way too, We have book-marked the idea within my favourites.During your search google I came across this post. The publish is what I am looking for. Complete post is actually written in extremely helpful way. Impatient for additional content.